My parents exist and I am here today. Been inspired by people around me, I am who I am today. Strengthen and integrate my body and soul. Here we call it Goju-Ryu Ningen Juku. I compete with myself to be better than yesterday. I aim to achieve better myself tomorrow. To do so, I live just now with my best. Begin with Rei, end with Rei. Begin with Kata, end with Kata. Kata is beauty and skill. Kata is the spirit of Ningen Juku. In these days, I often wrote about Taira san . Nowadays so many people have been came to this blog through Facebook and dojo website. By the way, I have supported Taira san using this blog because he is my old friend. But original target of this my blog was Okinawan and Japanese people. From next time I will move to Facebook about my comments on Taira san although The Facebook is a little difficult. Many karateka who love Taira san's technique were sometimes surprised to see his bunkai. 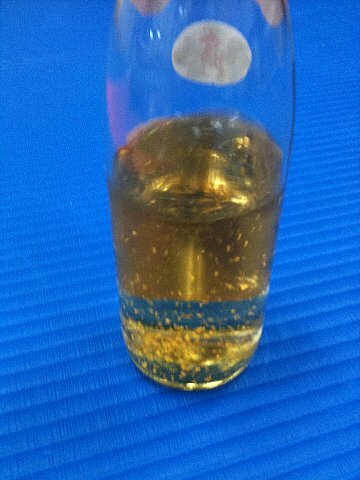 His bunkai in today is defferent from in yesterday. He has been improving his bunkai technique day by day. He does not stay in same position. He said yesterday after keiko that he would demonstrate his technique in the seminar in USA and N.Z. Thanks for dropping in this blog. Nowdays so many people come to this blog. Of course my English is not so good but I believe you understand what I want to say, don' t you? 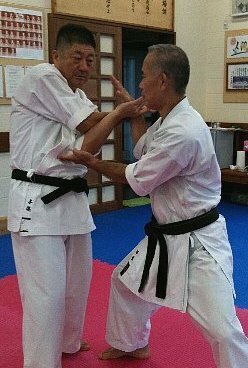 Taira san is now making the regulation of Okinawa Gojuryu Kenkyukai. Soon Glenn san will send it to karateka who loves taira san's karate.
" You can't understand what disconnecting with the power even if i say many times. you have to do many KEIKO. You need much experience. That is Gojuryu breathing technique." Soon new information for Taira san and Kenkyukai will be up in Ningenjuku website. 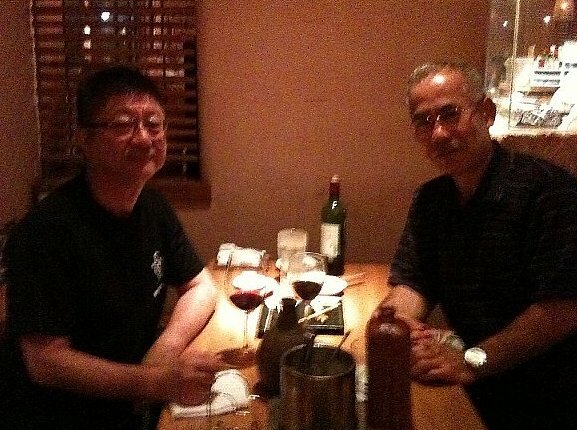 We, I and Taira san, talked about his new oraganization after KEIKO. 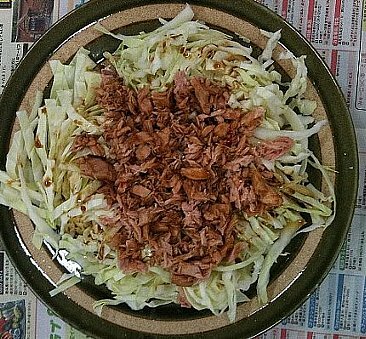 Taira san's favorite tsumami is simple, cheap and oishii. Gold leaves in awamori for taira san. i don't drink awamori but wine. OKINAWA GOJURYU KENKYUKAI will begin to move soon. Keiji Ito and Glenn McIlvride are as staff. yesterday i trained with taira san first time since my leaving jundokan and also his leaving jundokan. since now we are going to train together and i support him to make his organization. to contact him, use ningenjuku email address for a while. 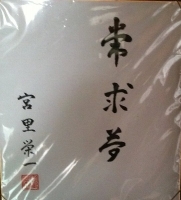 "the room of taira bunkai.com" will be opened soon in ningenjuku dojo web site. last night i was with taira san in the bar and we talked about the future plan. 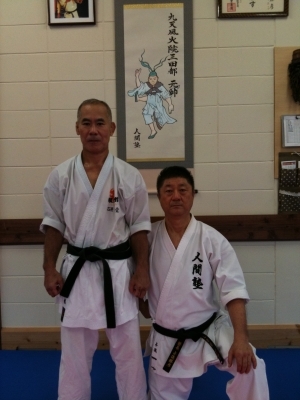 since taira san left jundokan, he has to build up his new group. he needs some help and i will assist his success as possible. taira san is my old karate friend and he influenced me much about the karate skills. one more thing, he is the official technical adviser for my dojo. taira san is very energetic for his future plan. to all karateka who love taira sensei's karate. see this, japanese website of ningenjuku dojo. it is usual story that the segmentation of organization after death of an charismatic leader. the more time passed the more segments. there is an words "so many men so many minds"
but the truth of the segmentation is only the power game, money. stop and think it in peace and quiet. watch his activities not his sayings. then go on your way, my friends. I do not know how many way of the meditation in this world. But our Okinawa Gojuryu SANCHIN is just like meditation to me. Every morning in dojo with no noise but with Hemi-sync music, to concentrate on deep breathing, to chase breathing,to chase imaginary KI. In good day morning is best, because of having sunshine. In my case , SANCHIN, SANCHIN DAI NI and TENSHO are one set, then at least I do 4 sets. After having my dojo and do SANCHIN every day, I now feel something actually. I did not feel it before. SANCHIN is the motion meditation. I am very happy because of meeting KARATE , because of meeing Gojuryu, because of meeting SANCHIN. Thanks God. SANCHIN and TENSHO are same and are different. same and different ? what ? SANCHIN is KIHON in traditional KEIKO ORDER and TENSHO is as HEISHUGATA. How come TENSHO is as HEISHUGATA ? In Japanese Kanji HEISHU means " closed palm" but TENSHO kata is opened palm. what does it mean ?
" It is said that ZEN has ZA ZEN, RITSU ZEN, GA ZEN, DO ZEN. SANCHIN is the DO ZEN and RITSU ZEN ." Please be careful who are in high blood pressure disease when do tough SANCHIN, especially in aged. Do not forget to care your body by stretching and other ways for head, neck, shoulders after SANCHIN KEIKO. Today it has been 11 years after Miyazato Sensei's passing away (in 1999) , so I went to Jundokan Honbu Ｄojo to pray and burn incense for Sensei. Until last year, of course I did it every year when I trained in dojo but today it is first time to sit and talk with Kancho Yoshihiro san in front of BUTSUDAN. And also I saw first time that Miyazato Sensei had wirtten that like The Affirmation. I asked to Kancho Yoshihiro when Sensei had written this but he did not know. Seeing this I imagined and I got the warm feeling and have felt close to him Sensei.